DETROIT -- A steep drop in sales to rental companies in June magnified General Motors' weak car sales, which sank 15 percent through the first half of the year. 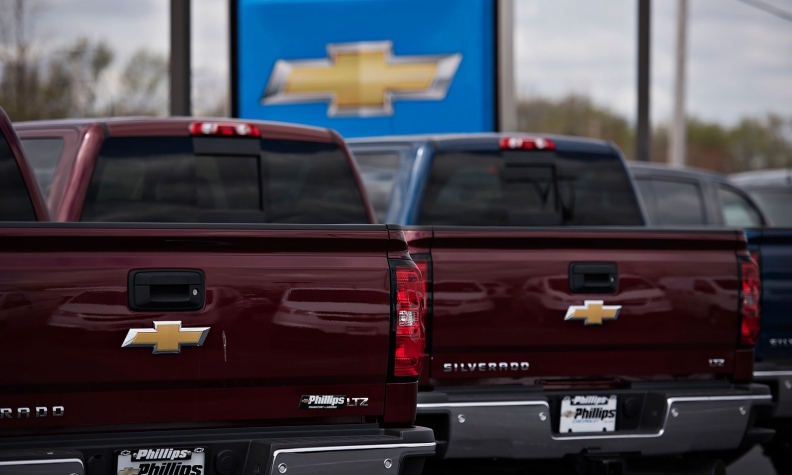 Red-hot demand for full-size pickups wasn't enough to give GM a sales gain for June, as overall deliveries slipped 3 percent. GM said today. Sales were hurt by a 45 percent drop in rental deliveries, which GM said it had planned as it seeks to trim rental sales in favor of more-profitable retail and commercial business. Sales to retail buyers rose 7 percent. That drove GM to an estimated 16.9 percent retail market share, up from 16.3 percent a year earlier and its best June retail share since 2011, GM said. GM leaned heavily on its biggest money makers, the Chevrolet Silverado and GMC Sierra full-size pickups, which rose a combined 19 percent. Sales of the Chevy Colorado and GMC Canyon chipped in a combined 9,090 in incremental volume (the midsize pickups weren't on the market a year earlier). But other bright spots in GM's sales report were tough to find. The fall in rental volume hurt GM's SUV sales. Combined sales of the Chevy Suburban and Tahoe, GMC Yukon and Cadillac Escalade dropped nearly 40 percent from June 2014, when GM was selling down outgoing '14 models while ramping up sales of the redesigned '15s. The decline in fleet sales among the SUV models ranged from 56 percent to 90 percent, GM spokesman Jim Cain said. That is partly because of tight supplies as GM runs its Arlington, Texas, plant flat out to keep up with demand. "We are prioritizing retail sales," Cain said in an email. Buick sales sank 18 percent, with the Encore small crossover the only one of the brand's five nameplates to avoid a double-digit percentage sales drop. Chevy sales fell 3.9 percent on steep drops for several car lines, including the Impala (down 42 percent), Cruze (down 13 percent) and Sonic (off 19 percent). Cadillac sales were off 3 percent. Deliveries of its best-selling nameplate, the SRX midsize crossover, rose 24 percent. Sales of other vehicles in the lineup declined, including a 29 percent drop for the CTS sedan. GMC was the company’s only brand to post a sales increase, up 8 percent from a year earlier. Kurt McNeil, GM's U.S. vice president of sales operations, said in a statement that consumer optimism about employment and the economy is underpinning sales.